Local Motion executive director Emily Boedecker stands outside Champlain Mill during a press conference announcing the installation of bike lockers in Winooski and Burlington. 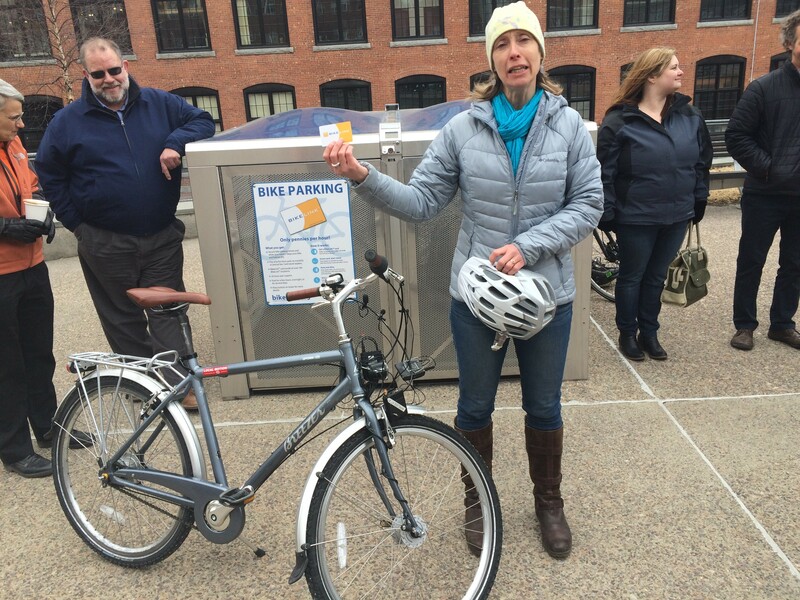 Local groups today unveiled two bicycle lockers in downtown Burlington and Winooski in hopes of encouraging the use of alternative transportation. Go! Chittenden County, a partnership of government and nonprofit groups, has installed BikeLink lockers outside Champlain Mill in Winooski and at the Burlington Town Center. Each locker, accessed by a keycard for registered users, has space for four bicycles. They cost five cents an hour to use. Go! Chittenden County leaders say the lockers will strengthen the region's burgeoning demand for alternative transportation methods. The Burlington-Winooski area is the most densely populated part of Vermont, supporters said. The locations are near Chittenden County Transportation Authority bus stops and in downtown locations where CarShare Vermont often has vehicles available for use. "Building roads is not going to be an option for walkable and really cool communities," Winooski city manager Katherine Decarreau said. "Hopefully, 'alternative transportation' will no longer have to bear that moniker 'alternative.'" The lockers are designed to cater to both workers who store their bikes for the day and visitors making a quick trip downtown. BikeLink users obtain an account, backed by their credit card, and receive a small plastic card that they swipe to access any BikeLink locker. Interested users can sign up at http://www.bikelink.org. "This is an opportunity for everybody to explore their transportation options," said Emily Boedecker, executive director of the nonprofit Local Motion. Other Chittenden County communities have expressed interest in getting lockers, Boedecker said. The lockers cost $16,000 to install and operate for five years. Funding came from federal grants and the Vermont Agency of Transportation. BikeLink lockers are widely available in California, but the lockers announced Thursday are the first in New England. Washington, D.C. is the only other location on the East Coast with BikeLink lockers. Boedecker said that if demand proves strong, additional lockers will be installed in the area.